Margo is similar to Go but played with balls that stack. Pinned balls survive capture to remain active in the game. There are 2 editions: Ninja and Samurai. You can also purchase aditional components (such as red balls for a 3rd player, or bowls). Margo Ninja (2 players) : Small, light, portable. 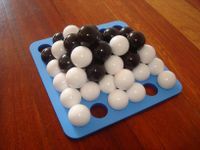 It includes a white bag, a 6x6 blue foam board, 72 plastic balls (19mm diameter) in 2 colours (36 white, 36 black).